SÃO PAULO, BRAZIL – The effects of an ailing economy and slowly rising unemployment rates have led average prices of residential real estate rentals in Brazil to decline by 1.30 percent over the past twelve months, according to the FipeZap index for July. This drop is happening despite a steady increase in inflation, which is forecasted to reach over nine percent by Brazil’s Central Bank. 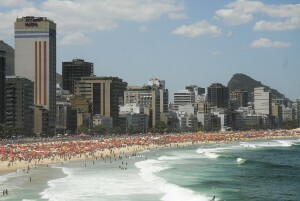 Rental prices register declines in major Brazilian cities such as Rio, photo by Tania Rego/Agencia Brasil. The latest FipeZap index, released by the Economic Research Foundation Institute (Fipe), shows that for the second consecutive month there was a nominal decline (actual decline in rent prices) in nine of the cities surveyed. The largest annual rental declines were seen in Rio de Janeiro, down by 6.40 percent and Curitiba, down by 2.81 percent. In a monthly comparison the nine cities registered a negative variation of 0.67 percent, while inflation during the same period rose by 0.62 percent. The forecast for the inflation in Brazil for 2015 was increased again after data for June and July was registered by the IBGE (Brazilian Statistics Bureau). While the Central Bank’s forecast had reached 9.15 percent for the year on Monday, July 20th, the IBGE’s IPCA-15 Consumer Price Index could reach 9.25 percent. With the unfavorable labor market and monthly wages decreasing, rental prices tend to adjust more rapidly to the current economic instability than real estate purchase prices, said Fipe economist Bruno Oliva to O Globo. “There is more room to negotiate since owners tend to agree to reduce rent prices more easily than (real estate) purchase prices,” says Oliva. Yet despite the decline in average rental prices, the city of Rio de Janeiro continues to register a very high price per square meter rate for residential spaces. The city which is hosting next year’s Olympics has the highest average price per square meter of the nine cities surveyed, in July at R$39.61/sq. meter/month. Curitiba was were the survey found the least expensive price per square meter for rent (R$16.06/sq. meter/month), while São Paulo registered average rentals at R$37.01/sq. meter/month.